The objective of this report is to highlight the impact of long-term aging effects on parts, assemblies and equipments by investigating characteristics of aging as they impact specific material classes. Section 5 covers general reliability design considerations and appropriate tasks/techniques. The Reliability Information Analysis Center mission has continued to evolve over the years, with the greater recognition that reliability, maintainability, and quality are critical military system and commercial product attributes. Coincident with this evolution has been the recognition that these attributes have much more encompassing impacts than their specific attained metrics. For example, where at one time the measure of reliability called mean-time-between-failure (MTBF) was of interest in itself, now management and system planners have expanded their interest because of how that MTBF impacts such issues as sustainability and total ownership costs. 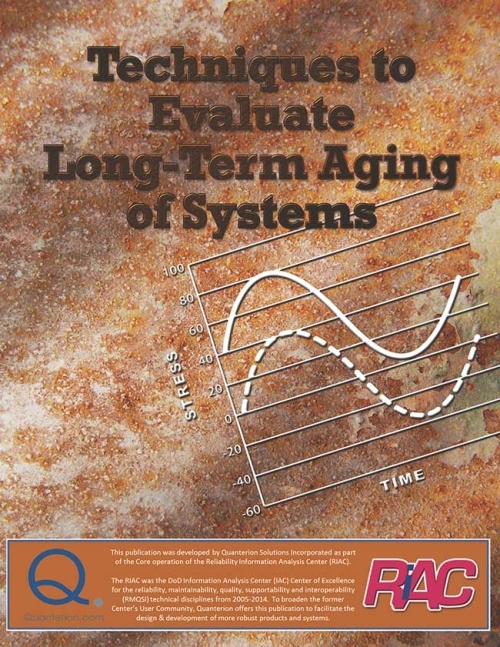 Part of the refocusing of reliability-related needs is the concern over long-term aging effects on systems in operation and in storage brought about by systems having to last longer. The objective of this report is to highlight the impact of long-term aging effects on parts, assemblies and equipments by investigating characteristics of aging as they impact specific material classes. The report is broken down into the following sections: Section 2 addresses general environmental design considerations for aging during in-service conditions; Section 3 discusses aging factors as they relate to ferrous and non-ferrous metals; Section 4 provides an overview of aging as it applies to polymer materials; and Section 5 covers general reliability design considerations and appropriate tasks/techniques.